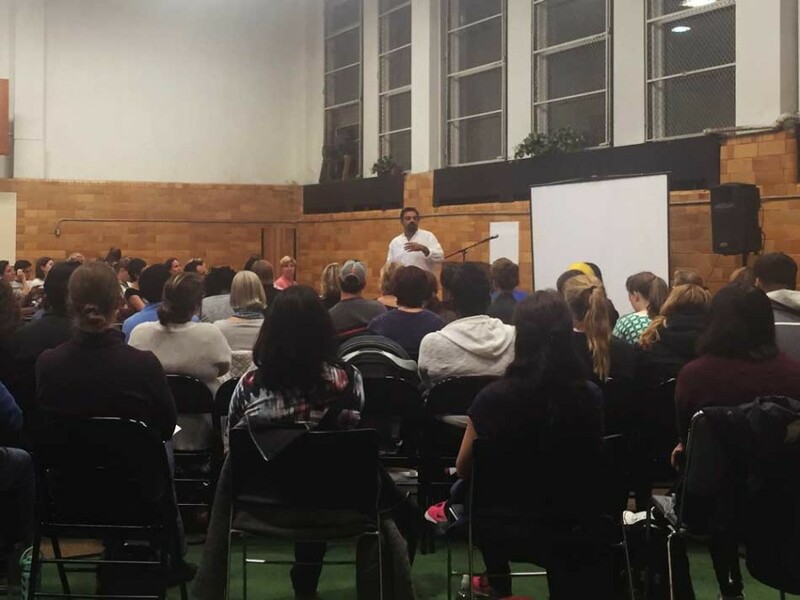 Rahul Sharma, an Evanston/Skokie District 65 parent and professor of diversity psychology, speaks to more than 100 parents in the first sessions of a series about navigating instances of discrimination. For the second year the District 65 PTA has partnered with the Evanston Public Library on the diversity series. District 65’s Parent Teacher Association partnered with Evanston Public Library to present its second series on diversity and inclusion, this year focusing on increasing dialogue among parents in the community. The first of four sessions took place Wednesday at the Family Focus Center in Evanston at 2010 Dewey Ave., in which four professional and parent storytellers shared personal journeys of overcoming discrimination based on race, gender or sexuality. Heather Sweeney, chair of the PTA’s Parent Education Committee, said she was motivated to create the program last academic year after a separate session concerning issues of diversity had an impact on her. “It totally changed the way I thought and viewed things with my kids, in Evanston, nationally and globally,” Sweeney said. The program’s debut last year, attended by more than 400 people, was aimed at coaching students and parents in navigating instances of discrimination. The goal of this year’s sessions is to build on that foundation, working toward building skills to act as an ally. The first session, titled “Seeing Each Other in the Stories We Tell,” drew more than 110 people. The program featured four professional and parent storytellers from Evanston or Chicago who shared anecdotes about journeys of diversity, followed by a dialogue facilitated by Rahul Sharma, a professor of diversity psychology at Illinois School of Professional Psychology at Argosy University and an Evanston/Skokie School District 65 parent. Sharma said the focus of the evening was “opening our ears and opening our hearts as we share stories with each other.” The programs were created to deepen parents’ understandings of each other’s experiences and especially to obtain the tools to teach children the same practices, he said. Kristine Nesslar, a writer and activist living in Evanston, spoke to attendees about her role as a white woman who observes her black husband and son’s experiences with discrimination. Nesslar said she had never experienced racism until she started dating her now-husband and now must worry about her two sons facing discrimination. Discussions about race are necessary to have with children because of how influenced they are by their parents’ ideologies, she said. “Children will not believe something fully until they hear their parents say it,” Nesslar said. Sweeney said last year’s series received positive feedback from attendees, leading to an expansion of its message across the district. Jenny Blickenstaff (Weinberg ’90), a parent of a fifth-grader and a seventh-grader in District 65, attended last year’s series and found that this year’s format was more conducive to communication between parents and speakers. The next session in the series on Nov. 16 will be co-facilitated by Evanston Township High School students.